Has anyone thought of two, two barrels on a log head? Probably Autolite 1.01 or 1.02's. It is really not much more flow than most 3 X 1 set ups. And the small six likes these carbs. No way to do a progressive linkage though. I guess I picture one carb equally spaced between cyl 1 and 3, and anouther between 4 and 6. A direct mount set up would be cheap, but some involved fabrication linkage wise. Last edited by eeyore on Tue Jan 27, 2009 12:34 pm, edited 2 times in total. Funny you should ask that. I was just looking at some old pictures on my hard drive. A fellow member ducktang sent me some pictures of a log head that had adapters on it to fit 2x2bbls. From what I remember the plate on the original 1bbl hole has a flat plat fitted to *mostly* block off the log, however it was not completely blocked off as it needed to act like a balance tube between the two "halves" of the new intake. I' guess that if you went with a progressive carb like a 32/36 webber (5200) it might work out fairly well on an daily driver. 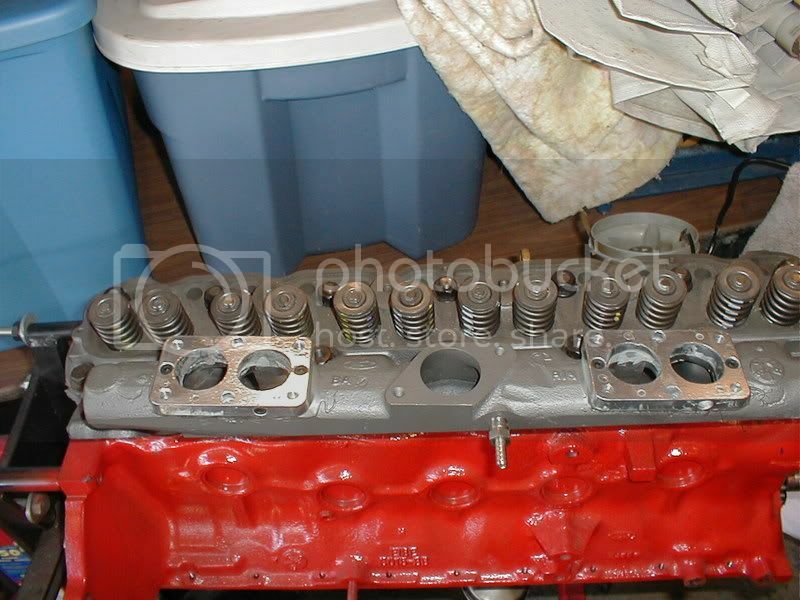 Just recently 63comet had a head he had reworked for two Weber 32/36 progressive 2 bbl carbs just as you describe, one for each half of the log. I thought it was a beautiful design. He had briefly put it up for sale on the Forum, but before I responded he deleted the post. I believe he made a wise decision. The improved fuel distribution and increased airflow certainly must have been a vast improvement, such as the triple one barrel setups a few on here have. I know it is not as free flowing as Mike's new aluminum head, but a neat use of ingenuity never the less. 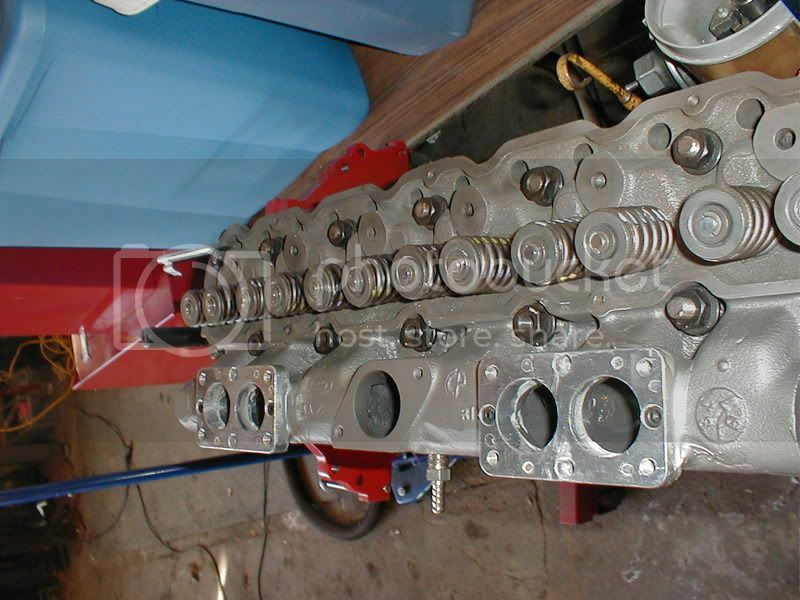 It is this type of thinking that got Mike to thinkng about cylinder head improvents so much that drove him to make that head design a reality. Thank you again Mike, for all of your hard work, even though I haven't been able purchase one of the new heads yet. Thanks guys, Ron's pictures are exactly what I was thinking. I too thought a divider may be needed to inprove the respose with the two comparativly big carbs. I never even thought about the progresive carbs, that's a good idea. Ultimately I'd like to use Mike's head and make a multi-carb intake. I would like to use a small six in a street rod and I like the multi-carb look, especialy on a six. But at this time the whole street rod budget is in question let alone Mike's head. Like alot of people these days I lost my job just before the holidays But life goes on, I'll have a job in time. Thanks again guys, and yes, thanks to Mike for everything he does for our little forgotten engine! 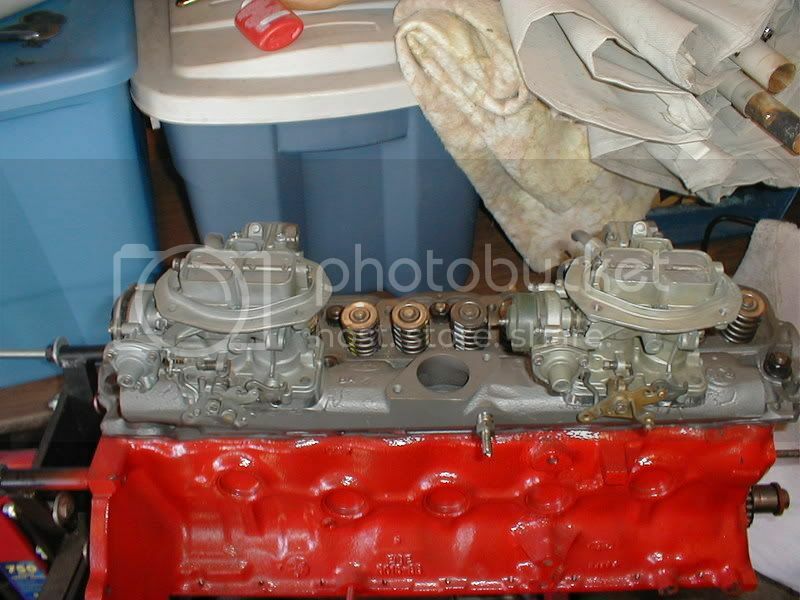 It still is for sale, I am not going ahead with the project as I decided to sell the head as well as the new cam and roller timing set from Mike, I am also going to sell off the spare motor and the transmission that was rebuilt (C4). I am just waiting to put everything on Ebay. 1963 Comet tudor with a 250 that has 255 v8 pistons, clifford cam 264*, clifford dual outlet headers with dual 2" exhaust thru glasspack turbo mufflers, mildly ported head with a Weber 38dgas directly mounted on intake log, and DII dizzy and MSD6AL ignition. C4 auto that has been rebuilt . Two progressive two barrels on a log. Do you have any pictures you could post of your two progressive two barrels on a log? Either with the progressive carbs on the head, or just the plates on the log? Or even better... both ways ! ! If you can't figure out how to get them posted, feel free to email them to me and I'll get them onto here. I would love to see them. This has long since been what I believe to be a just about perfect DIY intake solution for the 200.
i wonder if you'd get the same performance with two 1100v pony carbs mounted in a simular way. I ran two 1100's on my old engine and it ran really good all through out the rpm range. I started on a head like the one being discussed with two progressive 5200's. The plus too all this DIY self custom work is more horsepower and one bitchin lookin motor! if the tripple carbs are connected to the open log, then the log acts as sort of a plenum and will dampen/even out the pulsing effect out. but at the end of the day 1 , 2, 3 (or even 4,5,6) carbs will work. I'm going to likely use 2 autolite 2100's with the 1.08" venturi's and will have more than enough A/F to fun my little monster. 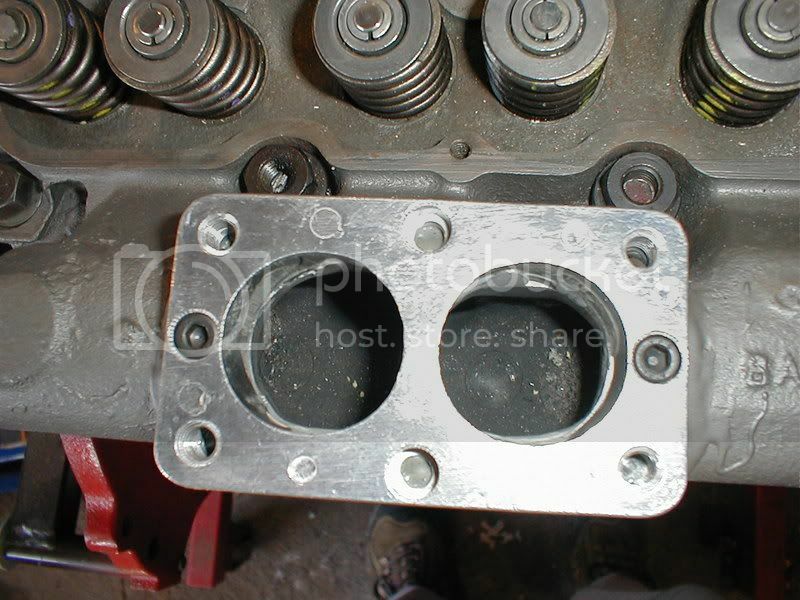 Also, about the divider between the carb's, basically making it a Dual Plane intake manifold; as far as the cubes we have and the relatively short stroke and small area of intake runner, it would likely be useless. I've gone over it with several hugely known performance engine builders and can find no reason to divide them. Wow! I didn't know what I was starting, this is great! Falcon & inline6, do you have any pictures of your set ups that you can share? I understand that splitting the manifold creates a dual plane, and I think for driveability with the two big carbs it may have merit. It would be real easy to test after the rest of the work is done. Make a removeable divider try it in and try it out. A couple of slots milled in the original carb opening to hold the divider is no big deal while you've having the manifold milled anyway. I'd love to see pics as well. 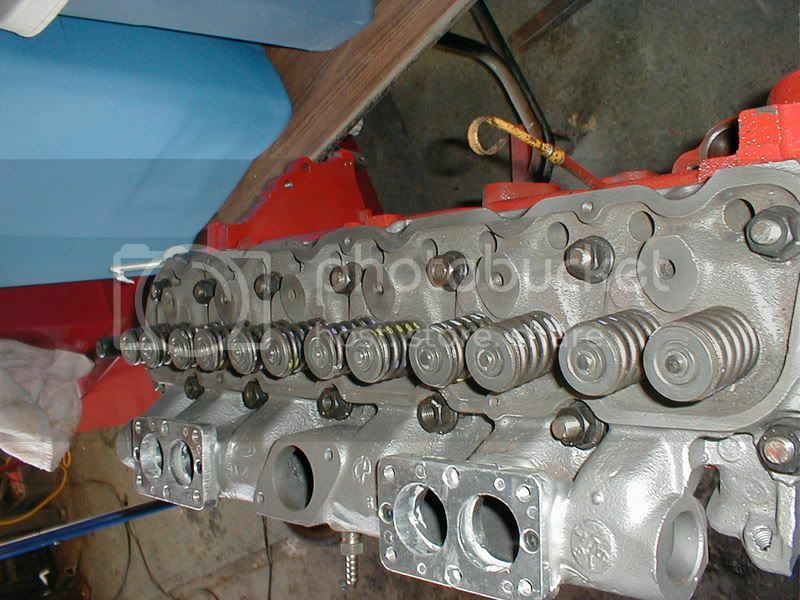 Dennis and all, Here are the pics of the head I had done this summer, It has new valves,(1.5 exhaust and 1.75 intake), new 289 valve springs and keepers and retainers, 3 angle valve job, and head planed for straightness. Last edited by 63comet on Wed Jan 28, 2009 12:23 pm, edited 1 time in total. Is that the round or the oval log head? And what did you use to seal around the mounting plates? JB Weld or brazing or what? That thing looks great too. It was a oval 78 log and what the machine shop used was some kind of high temp furnace epoxy. I have the same thing done on the head in the comet and I have run it for 3 years now with no problems. The same machine shop mounted a single plate on that one also. That looks awesome 63comet. How much did it cost to have the head adapted that way? For all the work minus the parts, the machine shop charged me 400.00. That included, magnafluxing and planing as well as 3 angle valve job and installing the valves. He also painted it with something to keep it from rusting It is for sale on Ebay including 4 H/W carbs and many extra parts for the carbs. second question about your set up did u have the carb mounts custom made or is there somewhere u can buy them? The adapters I mounted on the log are spacers for the H/W 5200 or Weber 32/36 carbs. I AM IMPRESSED ! ! ! This is really cool! I like the front / back analysis. I've seen pics of the triple, but a double log makes great sense too! I'd be inclined to try a double 1B! Great stuff! Great work guys! sold, looks like someone got a smokin' deal. Are those the jets you are using for 5200's or other Weber jets? Is it correct to say from the chart found here http://www.surpluselectron.com/aaron/holley.htm that the jet size (mm) listing is the newer designation for the old Holley listing? For example: If the Holley PN listing was a 124-200 than the corresponding jet on the chart would be a 125?